^ FRANKENWEENIE (PG). British Board of Film Classification. 2012-08-15 [2012-08-21]. ^ Wheeler, Jeremy. Frankenweenie. Allmovie. [2012-09-26]. ^ Goldberg, Matt. Disney to Release Tim Burton’s FRANKENWEENIE in IMAX 3D. Collider.com. 2012-03-06 [2012-03-06]. ^ Miller, Rosee. ‘Frankenweenie’ Official Synopsis & Story Details. ScreenRant. 2011-02-14 [2011-11-09]. ^ Denise Martin. USA eyes Grazer's Wife. Variety. 2005-11-15 [2008-08-15]. ^ Frankenweenie. John August.com. 2007-11-27 [2008-10-31]. （原始内容存档于2010-11-24）. ^ 9.0 9.1 Kit, Borys. John August tackling two film projects. The Hollywood Reporter. 2009-01-21 [2012-01-23]. ^ Smithson, Sean. NEW ONE SHEET FOR TIM BURTON'S FRANKENWEENIE. Twitch Film. 2012-02-02 [2012-03-06]. （原始内容存档于2012-02-29）. ^ Nick de Semlyen. Exclusive: The Lion King To Go 3D!. Empire. 2010-06-22 [2010-12-27]. ^ Singer, Leigh. The Magic of Tim Burton's Frankenweenie. IGN. 2011-12-13 [2011-12-16]. 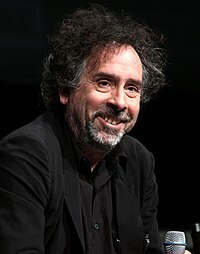 ^ Tim Burton Brings Frankenweenie Back to Life & We Got to Witness the Resurrection!. Babble. 2011-12-14 [2011-12-16]. ^ Hubschman, Daniel. Frankenweenie Set Visit Report Pt. 1. Hollywood.com. 2011-12-13 [2011-12-16]. （原始内容存档于2013-01-03）. ^ MUSIC INTERVIEW: DANNY ELFMAN Q&A - PART 3 OF 3. Buzzine. 2011-06-14 [2012-10-02]. （原始内容存档于2012-09-08）. ^ Morin, Natalie. Album Art Exclusive: 'Frankenweenie Unleashed'. Rolling Stone. 2012-08-03 [2012-08-10]. ^ Gallagher, Brian. Disney Announces the Art of Frankenweenie Travelling Exhibition. Movieweb. 2012-06-11 [2012-10-02]. ^ Tully, Sarah. 10 Disney attractions closing for rehab. The Orange County Register. 2012-08-30 [2012-09-15]. ^ Staff. Burton casts 'Frankenweenie'. The Independent. 2010-09-22 [2010-12-27]. ^ SCHEDULE: 'The Dictator,' 'John Carter of Mars,' 'Frankenweenie'. boxofficemojo.com. 2011-01-19 [2011-01-19]. ^ Frankenweenie – Movie Reviews – Rotten Tomatoes. Rotten Tomatoes. [2012-10-02]. ^ Frankenweenie – Metacritic. Metacritic. [2012-10-02]. ^ 北美票房十月回暖 新片《飓风营救2》强势登顶. 中国新闻网. 2012-10-08.